Figure C.1-1: Simple one-storey structure comprising four columns whose tops are connected by a rigid slab-diaphragm. 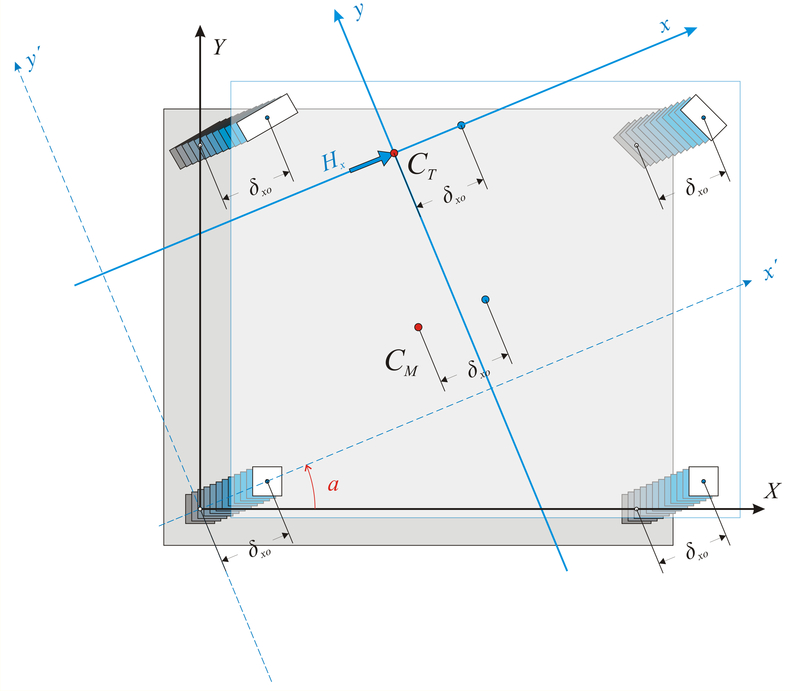 In general, when a horizontal force H acts on a storey level, all the points of the slab including the column  [*] Note Hereafter, the term “column” implies both columns and walls. 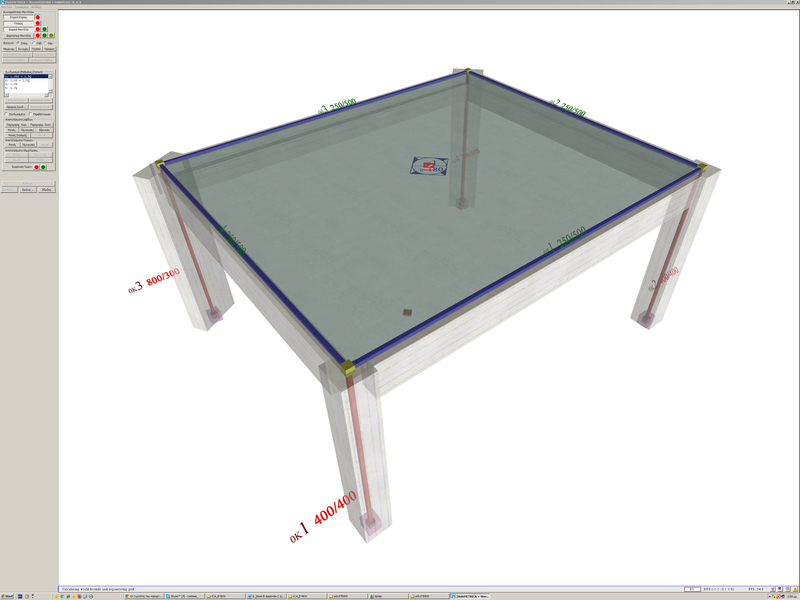 tops move in accordance with the same rules due to the in-plane rigidity of the slab. 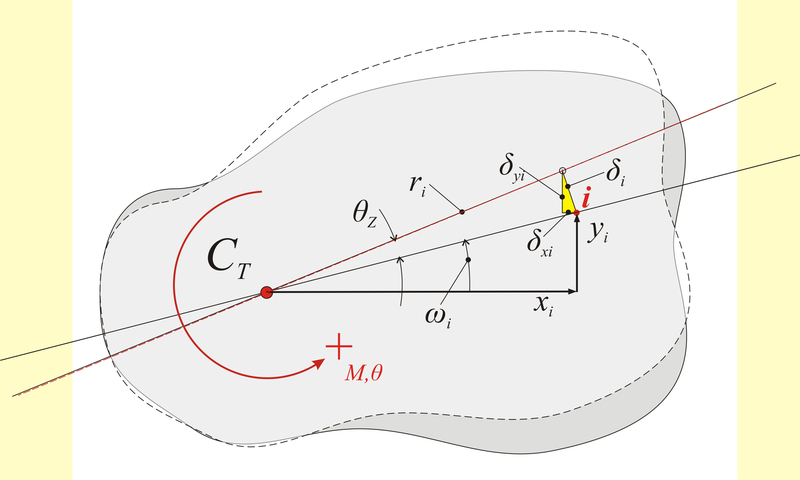 These rules induce the diaphragm to develop a parallel (translational) displacement by δxo, δyo and a rotationθz about the a point CT(xCT, yCT), the centre of stiffness, in the xCTy coordinate system, which has as origin the point CT and is rotated with respect to the initial coordinate system X0Y by an angle a. To better understand this chapter it is useful to study first §5.4. It is useful to recall the relationship between the two sets of components for the vector v(x,y) transferred from one coordinate system x0y to another ζ0η rotated by an angle φ with respect to the original system. This vector can be either a displacement vector, a force vector, or defining the location of a point. V ζ i =K ζ i · δ xi · cos φ iand Vηi=-Kηi·δ xi·sinφi. Quantities Kxxi and Kxyi are called normalised stiffnesses of column i in direction x. In every coordinate system, for each column i always Kxyi=Kyxi. Stiffness coefficients Kxxi, Kxyi and Kyyi are identical in all systems parallel to x0y, therefore to x’0y’ as well. In rectangular columns the angle φ is irrelevant since Kζ=Kη therefore (a) and (d) always give Kxx=Kyy =Kζ=Kη and (b) always gives Kxy=0. Stiffness Kij of each column i in direction j is Κ ji =(kji × EI ji / h 3)×kji,vα (§4.1.5).The columns are assumed fixed-ended → kji=12 and the shear effect is ignored  [*] NoteIf in the accompanying software , in project 4Columns, the option is selected to take into account works from shears, the factors of stiffness reduction kva have value 0.966 in the C1,C2 and the stronger value in column C3 by x: kva,x3=0.875. → kji,vα=1.0 (§5.1.1). Therefore, the column stiffness derives from the expression Κji=12×EIji/h3 . Also, the column torsional stiffness is assumed as Kzi=0. As elasticity modulus is assumed Ε =32.80 GPa corresponding to concrete C30/37 (§6.1) therefore C=12E/h3=12 × 32.80 × GPa/(3.03m3)=14.58 × 109N/m5 . The horizontal seismic forces are applied at each point with mass, while the resultant force is applied at the centre of mass CM. (3)  [*] NoteExpressions (1) and (2), are described in §5.4.2. 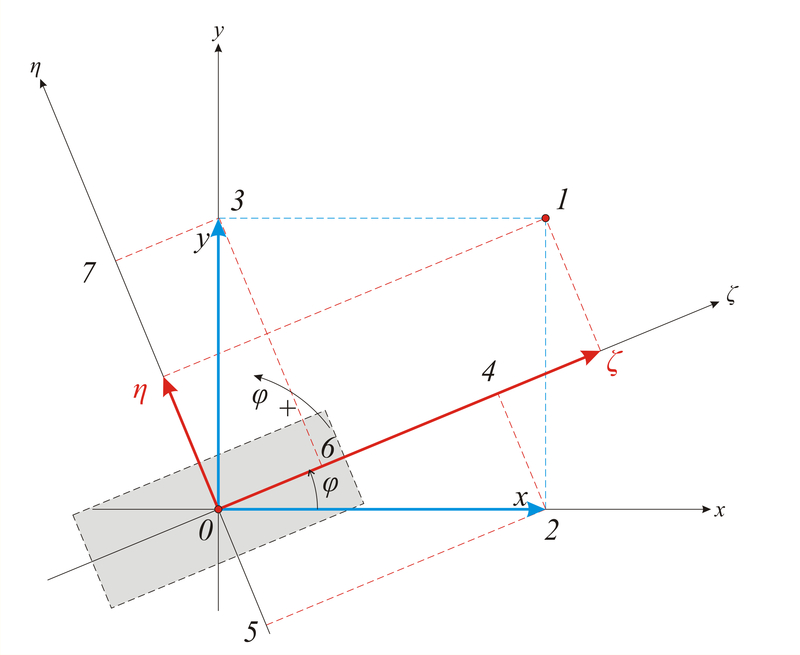 The angle a [*] NoteIf all columns are rectangular and parallel to the initial system, all angles φi are equal to zero. Therefore, tan2a=0 → a=0 and the principal system is parallel to the initial. of the principal system is calculated from this expression. However, the coordinates xCT, yCT of CT are still unknown. It is possible, though, to work on the auxiliary system x’0y’ which is parallel to the xCTy and has the advantage that its stiffnesses are the same with the ones of the final principal system xCTy. Therefore, coordinates X,Y are transferred to the x’,y’. Σ ((x’i- x’CT) × Kyyi-(y’i- y’CT) × Kxyi)=0 → - Σ (y’i × Kxyi)+ y’CT × Σ (Kxyi)+ Σ (x’i × Kyyi)- x’CT × Σ (Kyyi)=0. The quantity Κθ=Σ(Kxxi×yi2 + Kyyi ×xi2+Kzi) is called torsional stiffness of the diaphragm, measured in units ofmoment e.g. N×m, by analogy with the quantities Kx=Σ(Kxi), Ky=Σ(Kyi) which are called lateral stiffnesses of the diaphragm in direction x and y respectively and measured in N/m. The torsional stiffness of the column itself is usually insignificant and can be ignored (§5.4.3.4). Lateral stiffness Κ jk of diaphragm denotes the force in j direction required to cause displacement of the diaphragm by one unit in the k direction. Torsional stiffness Κθ of diaphragm denotes the moment required to cause rotation of the diaphragm by one unit. Solution: Four idealised columns E1, E2 and E3, E4 are placed symmetrically with respect to the centre C T and to the axes x and y, i.e. all four idealised columns have x and y coordinates with the same absolute values. Each idealised column isassumed to have a stiffness equal to Kx=1/4×Σ(Kxi) and Ky=1/4 ×Σ(Kyi). 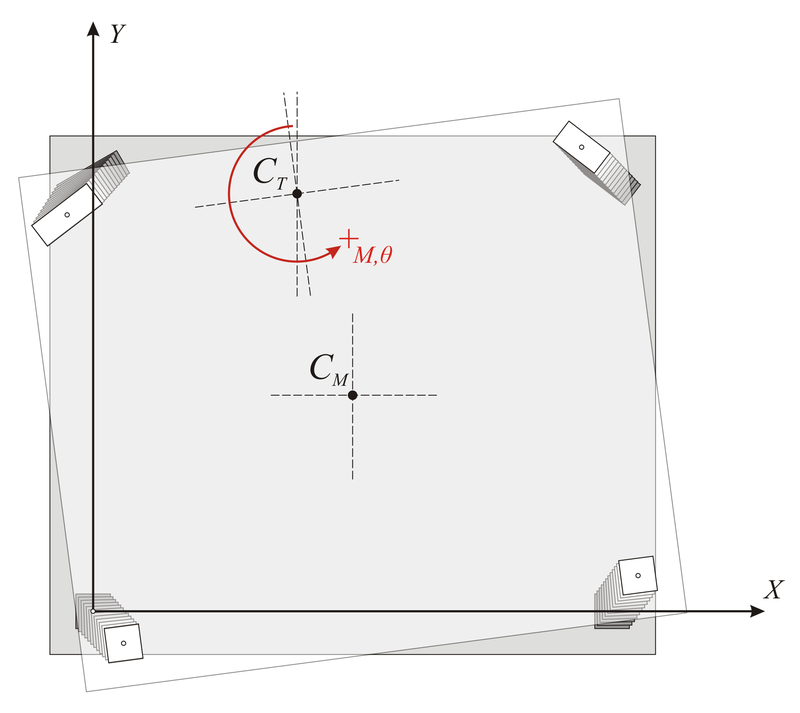 Stiffness by x: 4×1/4×Σ(Kxi)=Σ(Kxi) and stiffness by y: 4×(1/4) ×Σ(Kyi)=Σ(Kyi). The position of ‘walls’ is not significant, provided they are located as close as possible to the perimeter. It is significant, however,	to have high stiffness in both directions. Significant deviation between CM and CT can be handled by placing walls of high stiffness in the perimeter of the building. So far, all the calculations depended on the structure geometry and were not affected by the magnitude of the external loading. For instance the centre of stiffness, the structural eccentricities, and the torsional radii, are independent of the seismic force magnitude. 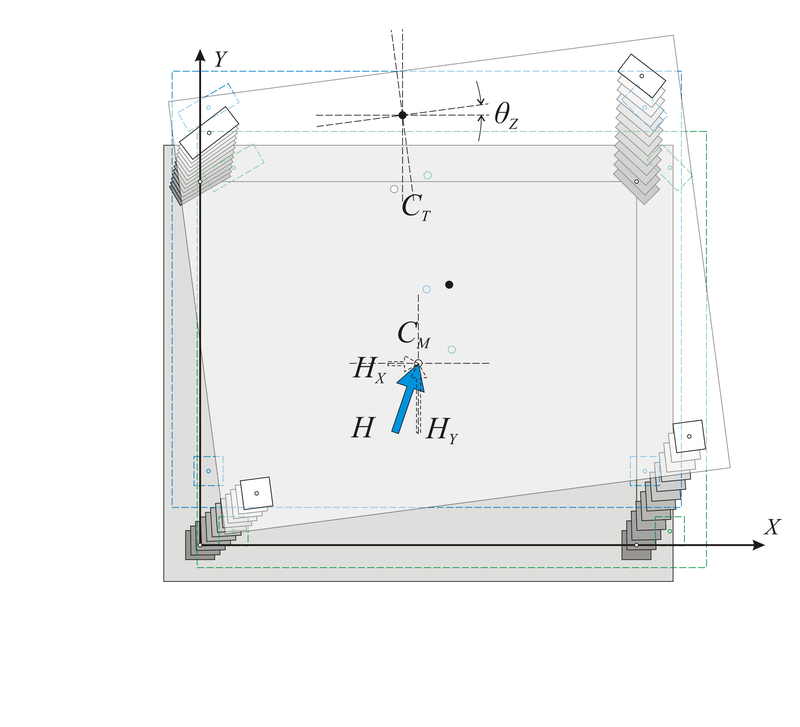 Next, the displacements and stress resultants of the structure, due to external seismic loading H, will be calculated. 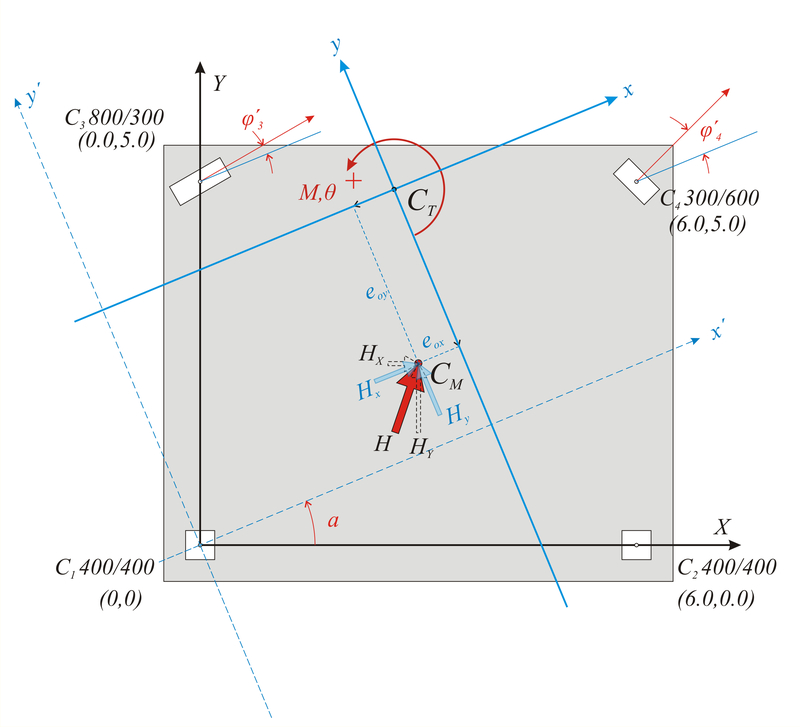 Example C.7-1: Given a horizontal force in x direction equal to is H=90.6 kN  [*] NoteThis force correspond to a seismic acceleration applied in the position of mass a=0.20g, therefore Η=Σ(mi)×0.20g= 45.3×103kgr×0.20×10m/sec2=90.6 kN , carry-out the analysis of the structure. By transferring to the local system where φ ’1=0.0-22.44 ° =-22.44 °. By transferring to the local system where φ ’2=0.0-22.44 ° =-22.4 °. By transferring to the local system where φ ’3=30.0-22.44 ° =7.56 °. By transferring to the local system where φ ’4=45.0-22.44 ° =22.56 °. In the example considered, for seismic action in X direction, the deformation due to rotation at column C2 gives δ x2, θ =0.400 mm, higher than the deformation due to translation δ xo =0.305 mm. The total displacement is therefore δ x2 =0.305+0.400=0.705 mm. The moment distribution factor is assumed the same in both directions a ζ i =a η i =0.50 [*] NoteMji,1-Mji,2=Vji·h (where h is the column height) regardless of the actual stiffness of the columns and the fixity factors at their top and base. aji=0.50 means equal distribution of the moment at the top and at the base of the column. Summarising the theory for the calculation of displacements and stress resultants of a floor diaphragm the following computational procedure can be formulated. This procedure has also been applied in the related file <diaphragm_general.xls>  [*] NoteThere is also the related file supporting the special case of parallel rectangular columns described in the § 5.4. . This Excel file may be used to verify the calculations of this and the following examples, but also of any other floor diaphragm. 1. 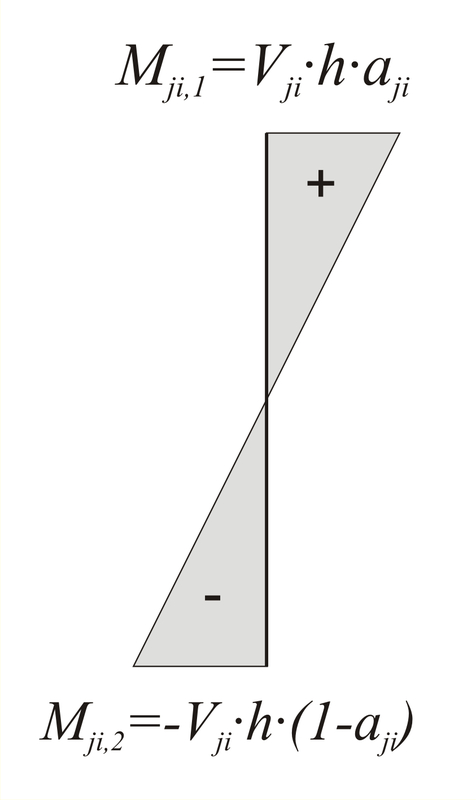 Calculation of column stiffnesses K ζ i , K η i , Kzi and angle φ i [*] Note Angle φi in the local system ζ,η is met only in elements of unsymmetrical cross-section e.g. L, unequal T, Z, etc. in the local system. 5. Calculation of each column centre of gravity and centre of mass (x’CM, y’CM) using the relationships for the transformation from the principal system X0Y to the auxiliary system x’0y’. 7. 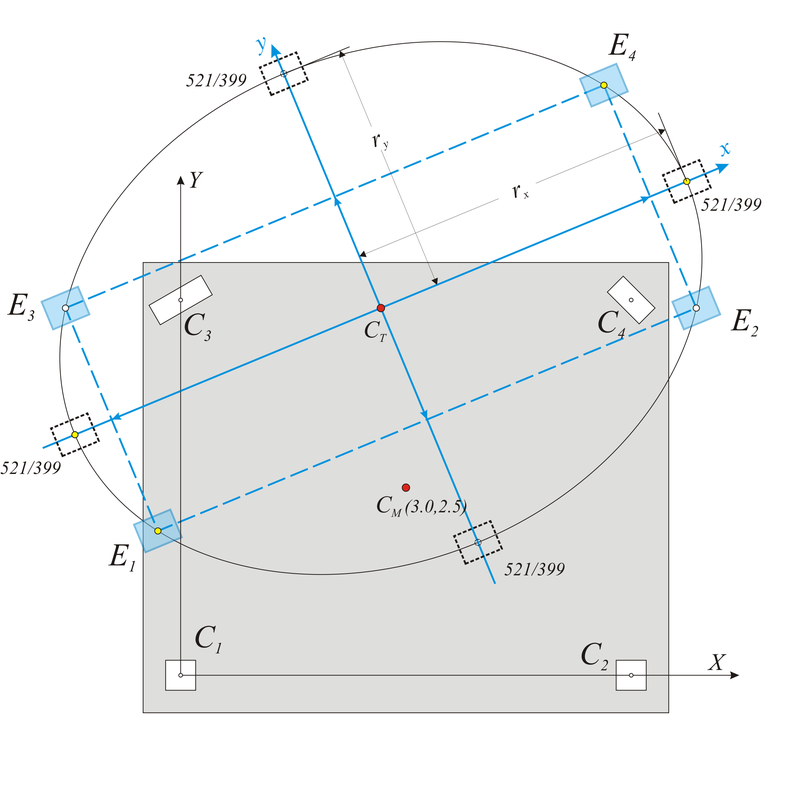 Transfer of the coordinates x’, y’ of the diaphragm CM and each column centre of gravity in the principal system. Calculation of the	structural eccentricities eox, eoy using the expressions (6’). Up to this point the calculations are independent of the external loading. Next, the stress distribution and the elastic deformations of the diaphragm elements, due to the external loading, are calculated. 10. Transfer of horizontal forces Hx, Hy and moment MCT to the CT using the expression (9). 11. Calculation of displacements δ xo , δ yo and θ z of the CT using the expressions (10). 12. Calculation of the displacements δ xi , δ yi of each column top using the expressions (11). δ x = δΧΥο · cosa+ δ YYo · sina and δy =-δYXo·sina+ δ YYo·cosa. The method which describes the diaphragmatic behaviour of each floor is presented in Appendix D. Also relevant examples are presented verifying the validity of the algorithms of the general method. 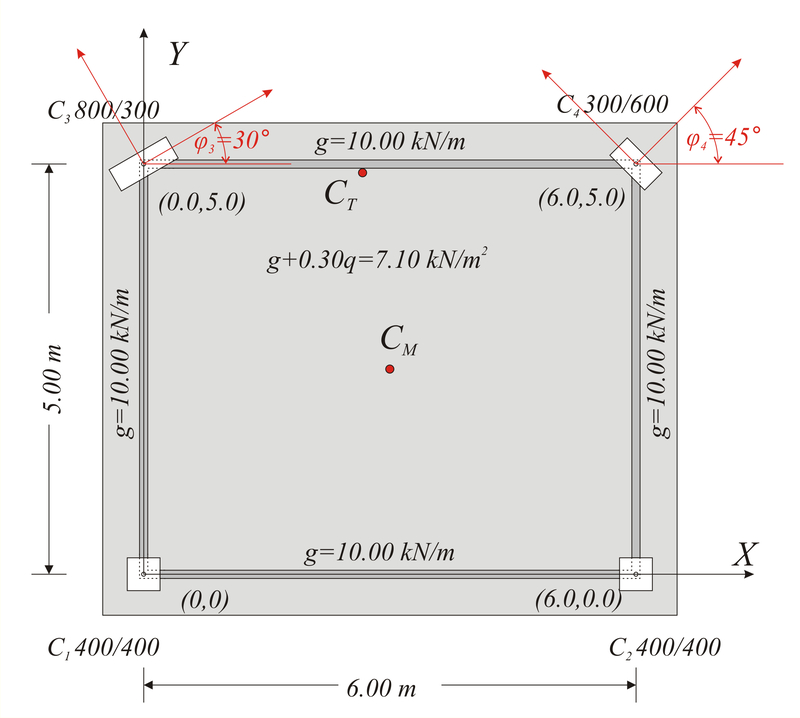 The analysis of the one-storey space frame illustrated in the figure, under horizontal seismic force H=90.6 kN is performed by means of four methods: (i) analysis using manual calculations, assuming fixed-ended columns, (ii) analysis using the Excel file, assuming fixed-ended columns, (iii) analysis using the Excel file, assuming columns with k=6, (iv) assuming using software, assuming actual beam and column torsional stiffnesses. The names, loadings, coordinates and dimensions of slabs and columns are shown in figure of §C.1. The cross-section of beams is 250/500. The concrete class is C30/37 (Ε=32.80 GPa). This method was described via the example presented to all previous paragraphs of this appendix. The related <diaphragm_general.xls> spreadsheet is used assuming fixed-ended columns. 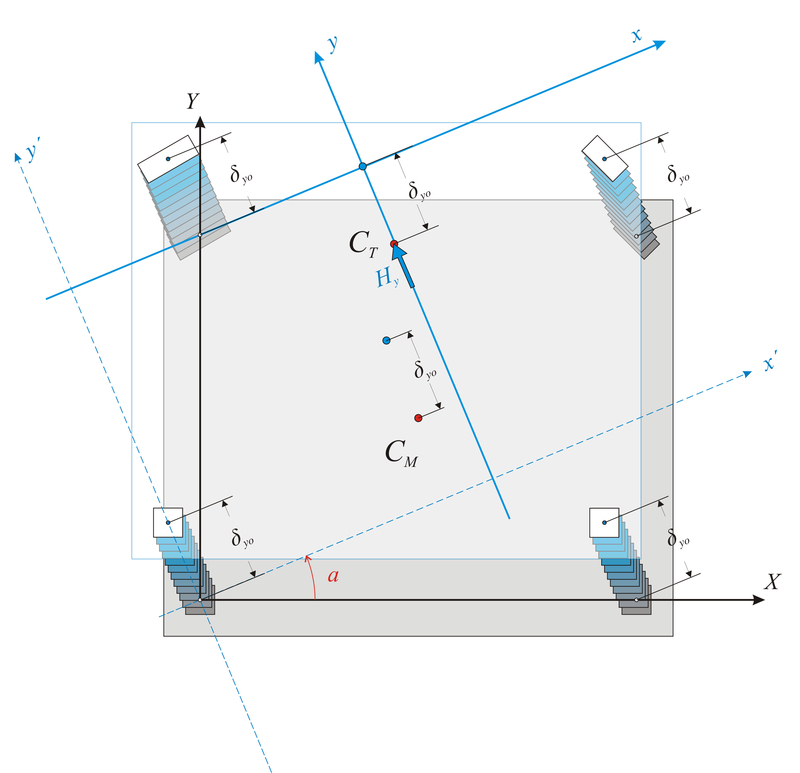 Figure C.10.2: The results are identical to those of the practical calculations.The torsional stiffness ellipse and the equivalent columns of the structure are drafted at the end of the spreadsheet. 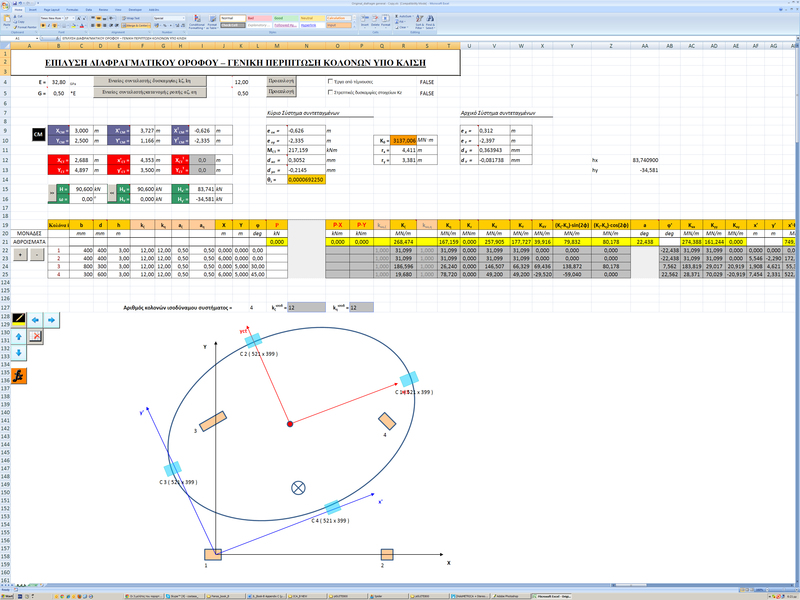 The torsional stiffness ellipse and the equivalent columns of the structure are drafted at the end of the spreadsheet. The centre of stiffness, the torsional radii and the stress resultants derived from this method are exactly the same as those	of the previous methods, with the exception of deformations, whose their relative values, however, remain constant 12/6=2.00. In order to define the diaphragmatic function of a building’s storey, with actual stiffness and not with assumption of fixed function of its columns,	it is necessary to use the appropriate software. Structural analysis software is necessary for one storey, as well as multistorey buildings, even in case of rectangular columns in parallel arrangement. The method which describes the diaphragmatic behaviour of each floor is presented in Appendix D and this example is analysed as example 1.